The Gods Are Not Happy! 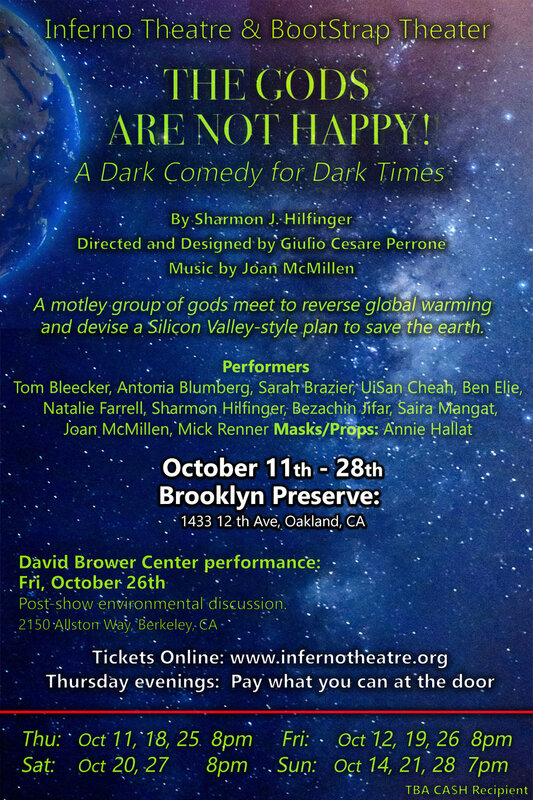 Co-production of Inferno Theatre with BootStrap Theater Foundation. Frustrated by the environmental mess humans have made of their beautiful earth, a motley group of gods get together to reverse the course of global warming. Arctic Raven; Egyptian Sun God, Ra; Mother Earth Goddess, Pachamama; Indian Widow Goddess, Dhumavati; and Chinese Employment God, Lhu Hsing show up when Demiurge, the divine creator of the Platonic world, calls for a meeting. After much bickering and infighting, the gods come up with a Silicon Valley-style plan to save the earth. However, they need money to make it happen. They kidnap a pair of elderly, billionaire brothers who have done their share of environmental destruction, and thus the extortion begins!